Montana Ranchers Bob Lee, Ray Marxer and Tom Milesnick have won numerous awards for their innovative approaches to raising beef cattle and managing the western range. While creating a healthy environment and abundant grasslands for their cattle, they and other ranchers and farmers across the United States have provided quality habitat for wildlife. 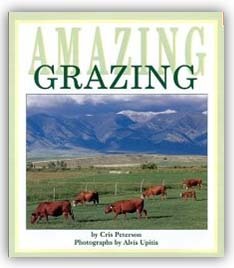 Cris has visited each ranch to learn firsthand about the philosophy of their owners as well as how the ranches are run. Alvis Upitis has captured the sheer beauty and magnificence of the open rangelands, the crystal clear streams, and the mountains that tower over them. Together, this award-winning author-photographer team presents an exciting portrait of a new approach to ranching and environmental conservation in the American West.